One of the main attractions for miners and their families to Wells besides the obvious jobs in town, was the sports and recreation facilities the Wells Townsite Company helped to build. Job prospects were much greater in Wells in the 1930's than anywhere else in British Columbia. Wells was a community with the unique mixture and spirit of mining towns. Its people included English, Scottish, Irish, Scandinavian, Chinese and Europeans, all lured to Wells for the chance to gain employment during a very difficult time in British Columbia's history. Wells is and has always been surrounded by mountains, lakes and rivers, making it a nature lover's paradise. Locals took advantage of this and participated in just about every outdoor pastime there was! At one time, Wells had tennis courts, a golf course, two racetracks, a curling rink, a ski slope and ski jump on Cow Mountain. 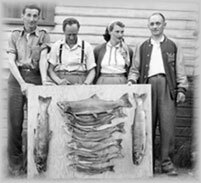 Fishing and hunting were popular pastimes and the "Wells Rod and Reel Club" was quite active in the 1930s, 40s and 50s. Locals would also hunt and fish to supplement their food supplies. The tremendous snowfall in Wells contributed to many locals taking part in the annual ski meet held in February, sponsored by the local ski club. Many first-class performers from outside points traveled to compete. This was a very popular event. Reof W Nordahl Kahldal and Henry Sodvet (two Norwegians) were the driving forces behind the building and operating of ski hills. The two built a jump nicknamed "Big Jump" due to the 175 feet of air one could attain lifting off of it. It was so good that the Western Canada Ski Championships were held in Wells the winter of 1936. There was an impressive downhill and slalom hill and a small (75 foot) jump. 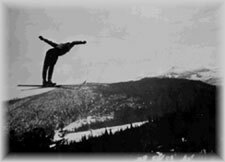 World-class ski jumpers competed here, and record Canadian jumps of over 60 m were set during the 1930s. 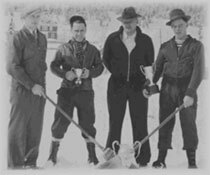 Wells hosted the Western Ski and Snowshoe Championships in 1936 and the Provincial Ski Championships in 1942. Most of the population of Wells owned skis. They were nothing like the hi tech skis of today, but they did allow people to have a lot of fun. For just $5.00 plus a dollar or two for a harness, Wellsians could enjoy a day of skiing. No ski boots, the skis just strapped onto the skier's regular winter boots and off they went11. Midnight ski meetings were not uncommon, sometimes with the whole community gathering to ski under the moonlight. Ice hockey was another popular winter sport in Wells. Local teams were sponsored by both mines and competed against each other as well as nearby Wingdam, Williams Lake, Quesnel and Prince George. The long distances to travel under winter conditions made it quite difficult for the players, as well as being quite expensive, but a fairly regular schedule was maintained. Two cups (one a challenge cup) representing the hockey championship of the Cariboo provided a source of interest which kept rivalry keen between the various teams. 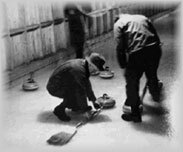 Curling was another popular winter sport. There were several different teams composed of members from Island Mountain, Cariboo Gold Quartz, and the Townsite. There were various club competitions for which numerous cups and prizes were donated by the mines and merchants, together with bonspiels with Quesnel and Prince George. The curling season closed in the Spring with a large and popular banquet and dance at which the prizes were presented. Badminton was also played in the winter and the badminton club had originally used the local theatre, which was large enough for one court. Unfortunately the theatre management put in a sloping floor and regular theatre seats, so that during the next winter the badminton club was without any accommodation until the new hall was completed in early 1938. The floor of the new hall was large enough to accommodate three courts; hence it was possible to take care of a much larger membership than before. Club competitions provided a source of interest within the club itself, and interclub meets with Williams Lake, Quesnel and Prince George providing a wider interest. Other popular winter sports included snowshoeing, dog sledding and ice fishing. Popular summer sports included basketball which with the completion of the Wells Community Hall, became a very popular sport due to the new and spacious floor suitable for the game. Cariboo Gold Quartz, Island Mountain and Barkerville fielded both ladies and men's teams, and people showed a great deal of interest. A few games were played with Quesnel. Trophies were donated for both ladies and mens competitions and these, of course, increased the rivalry between the various teams. Of all the sports to draw the largest crowds during the summer months, baseball was the most successful outdoor sport. There was an active league composed of teams from Cariboo Gold Quartz, Island Mountain, Wingdam, and Quesnel, and games were played with Prince George during holiday celebrations. A small fee was charged for the locals to attend the games and sometimes games would be washed out due to the considerable amount of rain that usually falls in the Wells area. 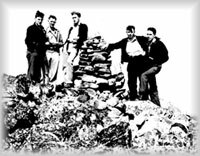 A local tennis club was active and maintained two clay courts, which were originally constructed by the Cariboo Gold Quartz, and in about 1941 some enterprising businessmen thought that they could build a golf course on the flats. They staked out nine holes, mowed nine greens and hired some young boys as caddies. Some of the youngsters in town had the job of spotting where the ball landed because it would have been impossible to find in the sawgrass flats otherwise. This golf course does not exist today12. The Wells Rifle club used the basement of the Wells Community Hall for their meets. Apart from shooting for sport, many Wellsians would fish and hunt to stock their pantries. Trout and Dolly Varden could be caught within walking distance of Wells. Many of the locals would also go gold panning in the numerous creeks throughout the area13. Events that took place in Wells and in Barkerville were a two-day sports celebration where various sports were sponsored by separate clubs. This celebration included horse-racing, baseball, track and field sports, etc., in which there were entries from Williams Lake, Quesnel, Prince George and other areas, and was held by the local Board of Trade. Another popular event was the Labor Day celebration in nearby Barkerville. There were pack on back races, mucking contests, pie eating contests plus many other competitions. Of course there was a gold panning contest. Horse races were held and one of the highlights of the celebration was a shooting contest. One of the features of the celebration was based on gold field history. During the original gold rush, legend had it that the stagecoach from Quesnel had been robbed while passing through Devil's Gulch, a few miles west of Wells. This was re-enacted in fine style15. The big day in Wells was the July first weekend. Wells had a well developed fair grounds on the flats including a half mile race track, a softball diamond plus other areas for such things as log sawing and log chopping competitions. A nail driving competition was always well attended and usually won By Ray Forbes who was a carpenter by trade. Mrs. Allstrop's horse, Blackie, invariably won the main horse race of the day16. Wells in the 1930's was a major centre for sports, community, the arts, and entertainment. Many people who have since left Wells have commented that their lives were never so full as they had been in Wells, in the 1930s. The early records of the Congregational Meetings in the late thirties and on through the forties and fifties show a steady growth of the church life in Wells, and many names appear in these records18. A schedule of church times from the Wells Chronicle (Nov 21, 1940) shows a total of 8 different services in one day.